Xiaomi recently launched the Mi A2 and the Mi A2 Lite, both the phones received unprecendented buzz at the global launch event. The company had been teasing both the phones for quite some time before making them official, two days ago. The Mi A2 may be the Mi A2 Lite’s elder and slightly more powerful cousin, but the latter does offer some fantastic features despite the targeted market, which is budget smartphones. Let’s take a look at its pricing alongside its top 5 features that make it stand out. Mi A2 Lite has a 5.84-inch full-screen display with 1080 x 2280 Full HD+ resolution and a 19:9 aspect ratio. Interestingly, similar to premium smartphones, this device sports a notched display. The notch houses the frontal imaging unit, notification light, proximity sensor and the ear-piece. Despite being a budget smartphone, the Mi A2 Lite features a 12MP + 5MP AI Dual-camera setup. The unit comprises of a 12MP Sony IMX486 primary sensor coupled with a 5MP Samsung SSK5E8 secondary sensor. Thanks to the dual-camera setup, users will be able to capture photos with DSRL-like background blur using the AI Portrait Mode. The dual-camera setup on the back will come with AI scene detection feature as well. there is a 5MP selfie snapper on the front with Portrait Mode that brings bokeh effect. But it lacks the Face Unlock feature. The Xiaomi Mi A2 Lite packs a big 4000mAh battery pack. Given the screen size, the mid-tier Qualcomm Snapdragon 625 octa-core processor, and the Android One OS, the large battery can potentially offer some really long screen-on time. The battery should allow users prolonged time away from the charger. This will be a very welcome aspect especially because the Mi A2 Lite skips Fast Charging. Interestingly, Xiaomi Mi A2 Lite doesn’t offer the newer and fancier Face Unlock feature. However, it does offer a fingerprint scanner for biometric authentication. The rear-mounted sensor is quite fast and capable of securely locking and unlocking the device without bringing it up to the face. The smartphone also offers an IR blaster. This hardware addition might not be a great feature, but given the screen size, the device can serve as a universal remote for the many gadgets that rely on the battery-operated IR remotes. This smartphone can easily become a smart hub for controlling such devices. 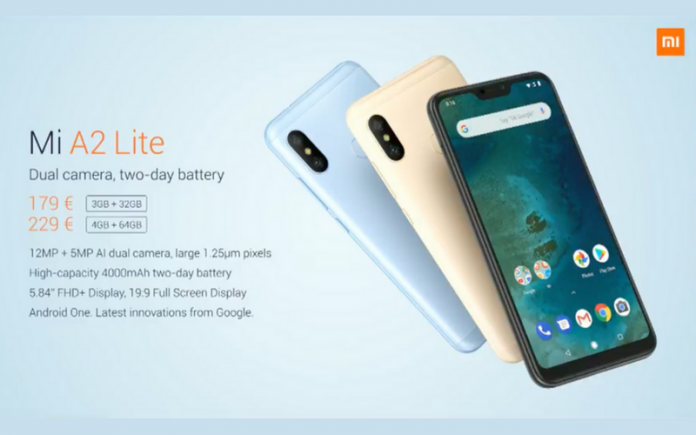 Both the Xiaomi Mi A2 and the Mi A2 Lite runs on Android One. The operating system is a parallel bifurcation of the Android ecosystem developed by Google. However, the Android One is a rather clean version of the operating system that doesn’t have much customization. In other words, users will not get any fancy custom skins or layers atop Android One. But they will certainly receive security and feature updates fairly quickly. Incidentally, the Mi A2 Lite comes with a dedicated microSD card slot for further expansion up to 256GB. The phone runs on Android Oreo 8.1, and it is upgradable to Android P. in the connectivity department, Mi A2 Lite packs Wi-Fi 802.11 a/b/g/n, Bluetooth 4.2 Low Energy, GPS with A-GPS, GLONASS, BeiDou, and 4G VoLTE with dual SIM support. Incidentally, the Mi A2 does not include USB Type-C port but offers with Micro USB port. Also, it has the trusty 3.5mm headphone jack, which the Mi A2 lacks. The smartphone measures 149.33 x 71.68 x 8.75mm and weighs 178 grams. It comes in three color variants: Black, Gold, and Lake Blue.